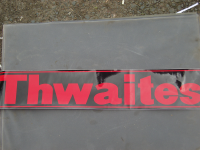 THWAITES Alldrive decal for standard skip THWAITES 4000. 6000, 7000, 9000 and 5 / 6 Tonne. Not suitable for two wheel drive models - too wide.